Summertime brings an abundance of delicious and fresh farmers market produce to our plates. 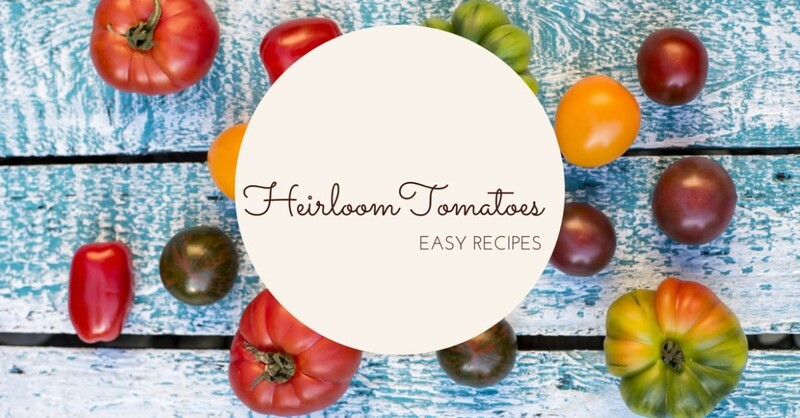 Something as classic as the heirloom tomato can take new life when prepared a new way in your kitchen. Many of our guests are looking for easy ways to enjoy the large number of tomatoes coming from their gardens (or markets). We’ve put together a list of our favorite (and very easy) tomato based dishes to prepare at home. Remember, look for the heirloom variety of tomato when shopping to get the best flavor and texture. Don’t be afraid of the yellow, orange and even purple/green colored heirlooms! They taste great and add a colorful pop to the presentation. *Helpful Tip: Don’t refrigerate your tomatoes! Instead, leave them at room temperature for the most intense and aromatic flavor. This simple and healthy dish is sure to please during the hot summer months as an appetizer or light lunch. You’ll need around 1-2 two medium size heirloom tomatoes for each person for this dish. Slice your tomatoes into bite size chunks. Lay them out on a large plate, making sure to not overlap them. Sprinkle some sea salt and black pepper over your tomatoes to taste. Thinly slice your red onion long ways, then turn the onion and chop the long slice into small minced pieces. Sprinkle a layer of the chopped onion all over your plated tomatoes. Next take 7-8 fresh basil leaves and roll them up together like you would a yoga mat. Now holding the rolled up leaves in place with one hand, slice the basil with the other so that you have thin strips. Now do one course chop over it all and layer the basil across your tomato onion plate. Drizzle some Extra Virgin Olive oil over the plate. Finally sprinkle some feta cheese crumbles over the entire dish. Serve as is or with fresh crusty bread. For a delicious vegan option, replace the feta with chunks of avocado. These make a wonderful addition to your homemade pizzas and pasta dishes. Roasting the Heirloom tomato concentrates the flavor into decadent and sweet pops of tomato goodness. Enjoy! Line a baking sheet with a layer of parchment paper. Slice your heirloom tomatoes into thick wedges and place into a large bowl. Smash 3-4 garlic cloves underneath the widest part of your knife. This will allow you to easily remove the paper on the clove. Now mince the garlic as finely as you can. Toss the garlic into the bowl. Drizzle around 1-2 tablespoons of Extra Virgin Olive oil into the bowl. Chop up any combination of fresh herbs you have readily available. We recommend any combination of Basil, Oregano, Thyme and Italian Parsley. Add your herbs to the bowl. Sprinkle a teaspoon of Coconut Sugar over the mixture. Now very gently, give the tomatoes a stir taking care to not mash the tomatoes too much. Pour the whole mixture onto your parchment lined baking sheet. Roast in the oven at a low temperature of 400 degrees for about 18-20 minutes. Stir about halfway through the cooking time. You’ll want to see the tomatoes starting to caramelize from the coconut sugar but still maintaining some of their shape. Take them out and add them to your favorite recipes!